It is predicted that the online event ticketing market is set to reach just under $70 billion by 2025 (GrandViewResearch). Online ticketing is arguably fuelling the success of the event and entertainment sectors. Selling tickets on your website means that gone are the days when customers would have to queue for hours in the cold to purchase a ticket to their favourite concert. Nowadays, ticket queues are online and can be joined from the comfort of your own sofa! This opens up numerous opportunities for companies of all sizes to market their events to a global audience via the internet. Although exciting, this accelerated growth has led to intense competition, with both large and small companies feeling the heat. It is more important now than ever to make the facilitation of online ticket purchasing quick and fuss-free, whilst faultlessly maintaining core brand values. Perhaps you’re new to selling tickets online and you’re wondering where to start? A quick Google search may confuse you, spitting up several third-party ticket selling websites that don’t quite fit the bill. Selling tickets on a third-party site poses the risk of making the experience less seamless and more clunky. Fear not, there is a way that you can sell tickets on your own website, helping converting that captured customer and providing added value throughout the ticketing process. Every brand tells a story with their event website, don’t let yours finish early. 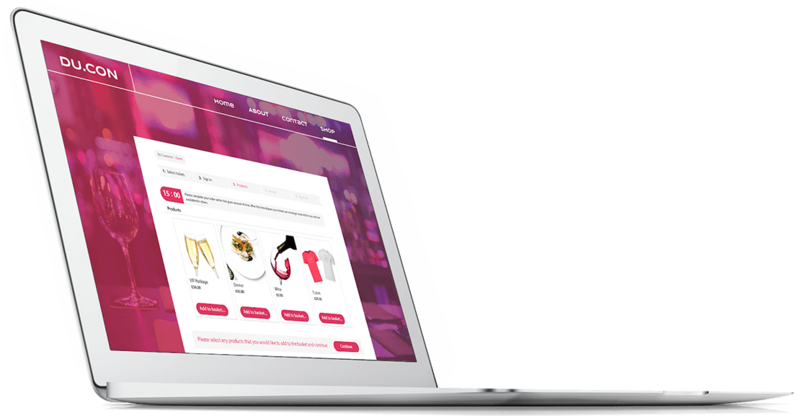 Imagine an immersive user experience that represents your brand all the way from click to checkout. You imagine it- we make it happen. Here at Nutickets, we have a dedicated account management team on hand to help turn your ideas into reality. Want to venture into an area that no other ticket seller has ventured before? No problem! 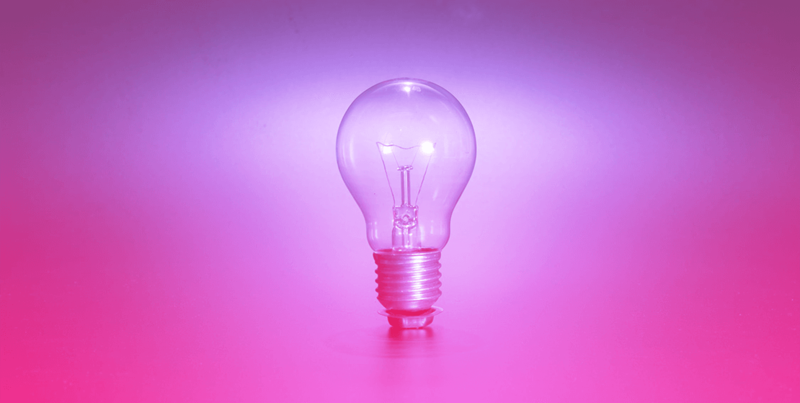 We’re always on hand to find creative solutions for creative ideas. Don’t let a third-party ticketing website steal the limelight from your event. Maintain complete creative control with a custom-designed, fully branded ticket shop. Your event is unique and now your ticketing process can be too. 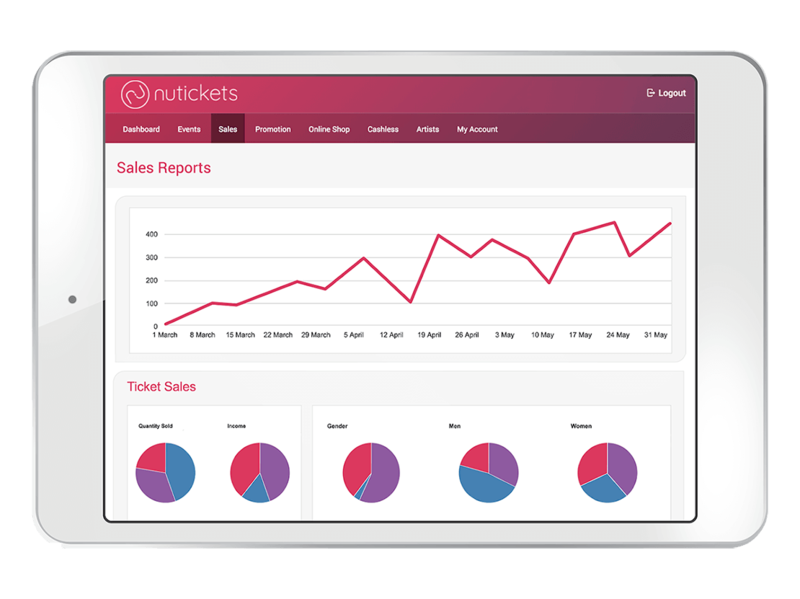 The Nutickets ticket sales software enables the creation of a white-label, bespoke ticket shop. This means that you can ensure your brand identity is central to the purchasing process. Customise every last detail of your ticket shop, perfect for all of you control freaks out there! 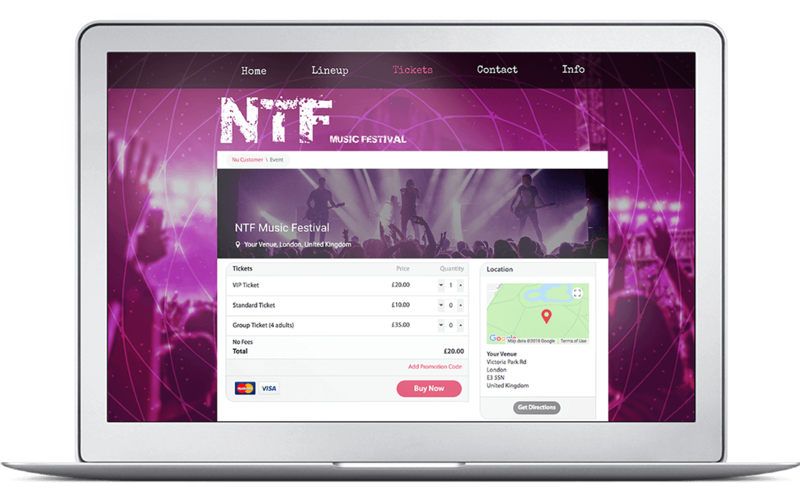 Selling tickets on your website is simple; create bespoke ticket types, then sit back and let our event software work its magic and build a ticket-selling website. With complete power over what the ticket types are called, you can select names that are perfect for your customer, as after all, you do know them best. So whether your customer is a savvy shopper, or looking for a VIP experience, you’ve got it covered. You can even create an initial buzz around your event with early bird tickets. Release a selection of discounted tickets to jump-start your sales. Your customers will thank you! Unlock endless opportunities and increase your earnings with our multidimensional extra features. 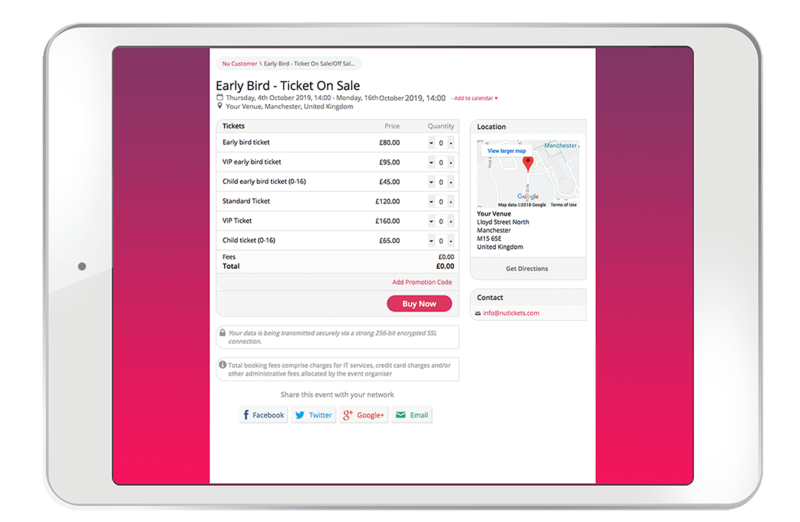 Nutickets truly is an all-in-one platform, with the best ticketing technology features right at your fingertips. Hate organising seating plans? Use our stress-free reserved seating software to allow customers to select their own seats prior to checkout. Want to receive extra revenue? Launch exclusive pre-sale merchandise to bump up the value of your customer’s cart. Nutickets is here to help you take your ticket sales to the next level. Experience data-driven analytics presented in a cohesive landing page, giving you the confidence to ensure that those all-important decisions are well informed. Uncover useful sales data, or delve deeper into your customers’ demographics, taking you onwards and upwards. Easily discover the best-selling products or seating areas, helping you to tailor your pricing structure. Supercharge your ticket sales, send out targeted communications, informed by data to make your customers feel as if you are speaking directly to them. Your event should be a fun, unforgettable experience that begins the moment a customer lands on your website. Feeling inspired? Start the journey today, view our price plans or get in touch with a member of our team to schedule a complimentary demo!